Q1. How to use the ifconfig command? Q2. How to make ifconfig display compact output? Q3. How to make ifconfig display info about a specific interface? Q4. How to disable or enable a network interface using ifconfig? Q5. How to change a network MTU using ifconfig? Q6. How to enable promiscuous mode on an interface? Q7. How to change hardware address of network interface? Network management work includes a lot of stuff, and precisely for this reason, there are several Linux command line utilities that help you with different kind of network-related tasks. In this tutorial, we will discuss one such utility dubbed ifconfig. But before we start with it, it's worth mentioning that all examples discussed in this article have been tested on an Ubuntu 16.04 LTS machine. If no arguments are given, ifconfig displays the  status  of  the  cur? displays the status of the given interface only; if a single  -a  argu? that are down. Otherwise, it configures an interface. Following are some Q&A-styled examples that should give you a good idea on how the ifconfig command works. Basic usage is fairly simple - just execute the 'ifconfig' command sans any options. In output, you'll see information related to all active interfaces. For example, in my case, the following output was produced. Note that in case you want the command to display all interfaces (including those currently down), use the -a command line option. For a short list output, use the -s command line option. This you can do by specifying the name of the interface as an argument to the ifconfig command. This you can do by using the 'mtu' flag along with the new mtu value. PS: For those who aren't aware what MTU is, head here. Promiscuous mode allows a network to receive all packets on the network. If that's your requirement, you can enable this mode using the 'promisc' flag. 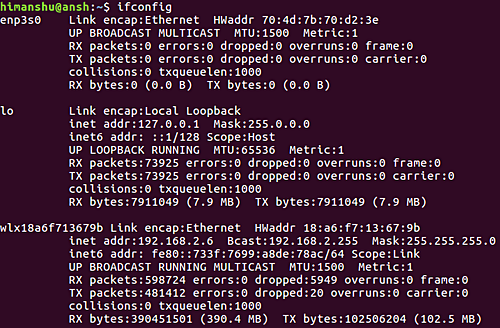 So you can see, the ifconfig command lets you do a lot of things related to network interfaces. While we have discussed quite a few command line options here, there are many others as well. Once you are done practicing the ones we've discussed here, head to the tool's man page to learn more. ifconfig, as all of the net-tools package commands, is deprecated. Is better to explain the ip command and alla of the iproute2 package commands.